Brendan McGovern is 51 going on 15. That’s what a new lease of life does to you. He’s relishing the opportunity to compete once more against the major champions of yesteryear, though he knows it won’t be easy. These guys are all seasoned campaigners, tough to beat. But so too is McGovern. McGovern is one of the most tenacious competitors you’re likely to meet. In truth, he sometimes comes across as prickly or guarded, but get to know him and he lets you in. That’s when the banter flows and his dry wit bubbles to the surface. He’s golf through and through, always has been. Through the unwavering support of his family, especially his wife, McGovern has been able to play out his vocation and passion on the same playground for almost 30 years; the one where swings are made, putts are holed and numbers get recorded in the small boxes. The Meath resident will yet again play with a different set of numbers this year as he takes another tilt at the European Senior Tour. He rolled the dice in Portugal in February and came up trumps. The t-shirt suggests he may have dressed in the dark (joking) ahead of the final day of Q-School but there was no ambiguity about his golf. McGovern had done his homework and duly came through the toughest examination of them all. Top of the class. “It was a massive week, it determined my playing rights for the year,” said McGovern, who was a wire-to-winner at Pestana Golf Resort in Lagoa, Portugal. He got the job done with rounds of 66, 66, 73, 68 to win by six with an 11-under-par 273 total. “I was also very familiar with the course from last year, so even though I wasn’t playing much golf I was certainly going through the [Pinta] course in my head. I might not have been match fit in terms of hitting balls but I got down to Portugal early and after two or three days playing you kinda get your game back quickly. 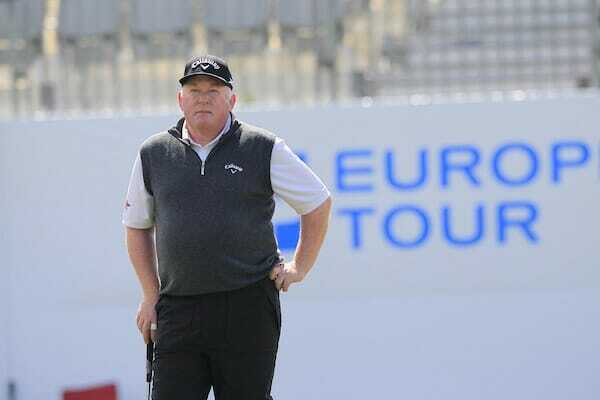 Mentally I had prepared very well for the week,” said McGovern, who has twice come through Senior Tour School. The difference compared to last year is McGovern will not have to rely on those Monday night phone calls to say he is first reserve then start thinking about booking last minute flights. 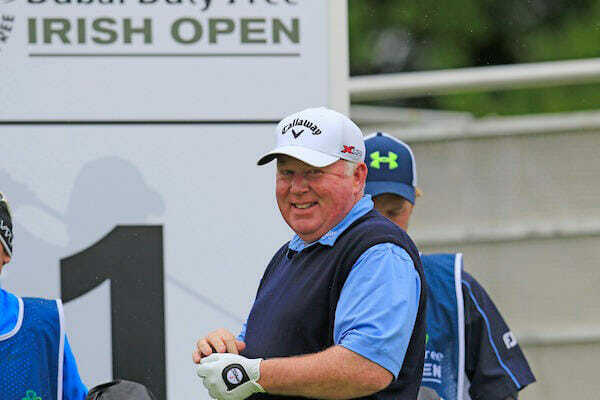 Apart from the Senior US PGA and Senior US Open, McGovern has a full schedule to choose from and is especially looking forward to the Senior Open Championship at Royal Porthcawl in July where Noble is booked in for another toting stint. The pair teamed up at Carnoustie last year and finished a credible tied 30th. McGovern is honest in his assessment of his own game, but knows he ticks enough boxes to be able to compete at this level. “At the end of the day I have to do what’s best for me, and I know how to get the ball in the hole. That’s the game, isn’t it? Just put a number in that box. Thankfully there are others who want to write that novel,” quips McGovern, revealing some of that dry wit and competitive streak. McGovern had several runs at the main European Tour Qualifying School (1988-94) but his main bag has been competing on the Irish PGA circuit where he has been a prolific winner for over 25 years. Pádraig Harrington once described McGovern as one of the most tenacious competitors and got to experience these traits first hand at the 2007 Irish PGA Championship at The European Club. The Irish PGA stalwart pushed Harrington all the way the week before he famously went on to unlock the Major secret at Carnoustie. For McGovern, this season’s challenge will again be something of a balancing act, dividing his time competing on tour and his role as head professional at the busy Headfort Golf Club in Kells. He talks of “making sacrifices, especially in your family life” but is thankful of the support he receives both at home and from the club. There is also the financial implication of competing on the road. Last year he made €55,216 from 11 events to finish 29th on the money list but the outlay is also much greater compared to driving to an Irish PGA event, especially as he has committed to a full-time caddy for the start of the season. Golf remains McGovern’s main driver. “I’m one of these fellas who is consumed by golf, it’s been my life. Over the years some people have said I can be hard to get to know, which has been a weakness and has gone against me in many ways,” was McGovern’s honest assessment of himself. For now though, all focus is on making his mark on the senior circuit. “I have to play well to make money. These guys are seriously good players. Ok, sometimes the tees are moved up on par fives but other than that the courses are set up in tournament condition with tough flags. Nothing is easy,” says McGovern, aware of the challenge he faces.